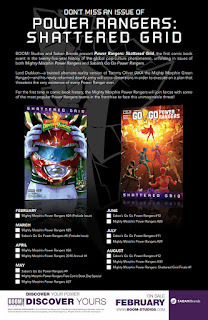 Comic Frontline: Mighty Morphin Power Rangers #26 Review - Go, Go Samurai! 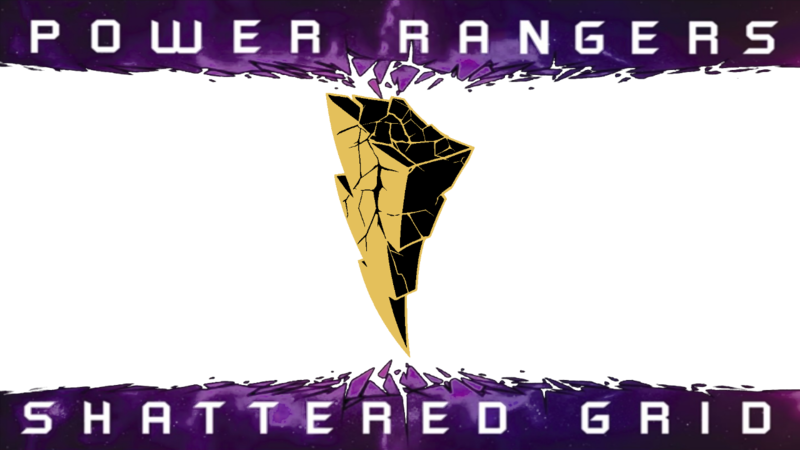 Previously in Power Rangers: Lord Drakkon, Tommy Oliver from another reality one where instead of joining the Rangers after the spell was broken decided to stay evil with Rita. Now he is loose as he sets out to destroy and take the power from the Power Rangers. When Kimberly and Jen the Pink Time Force Ranger are too late to save Tommy the Grid has fractured! How long before that fracture shatters? What will happen now? 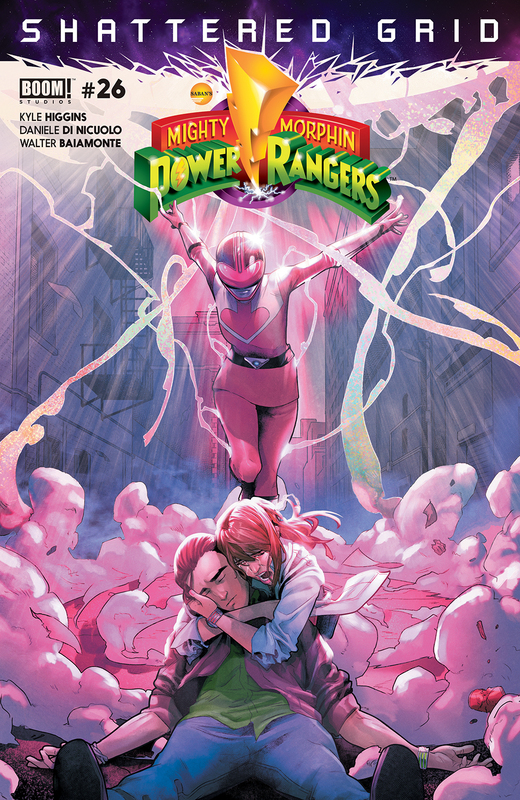 Find out next in this review of MIGHTY MORPHIN POWER RANGERS #26! 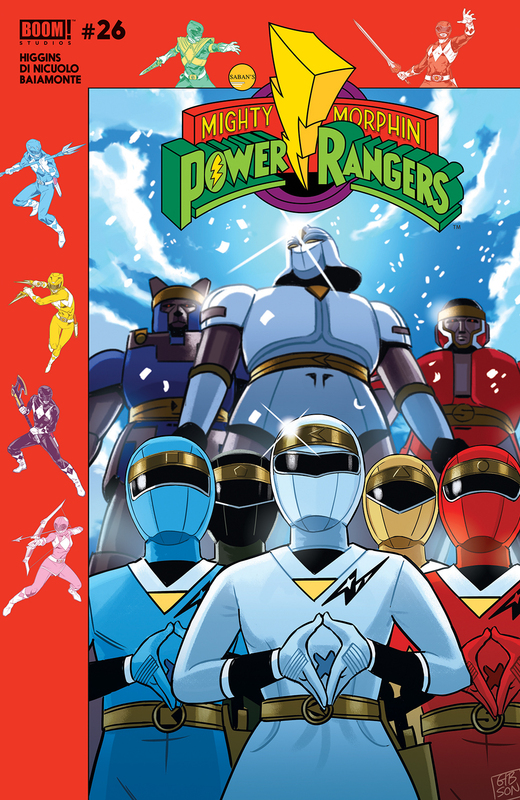 If you want the full impact of this issue then before you read this issue please be sure to read MIGHTY MORPHIN POWER RANGERS #25, then watch Power Rangers HyperForce Episode 19 and Power Rangers HyperForce #20. 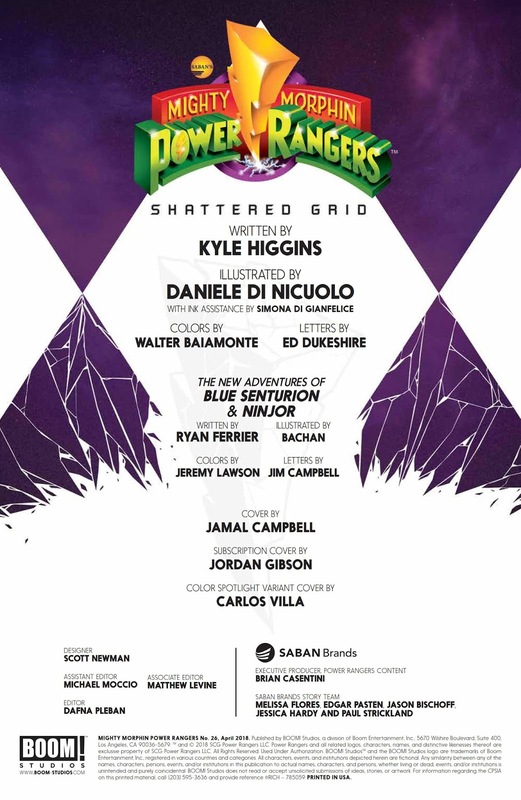 As I mentioned above this issue picks up after the Power Rangers HyperForce Shattered Grid two-part crossover. Lord Drakkon has returned to his palace where his loyal sentries welcome him back. 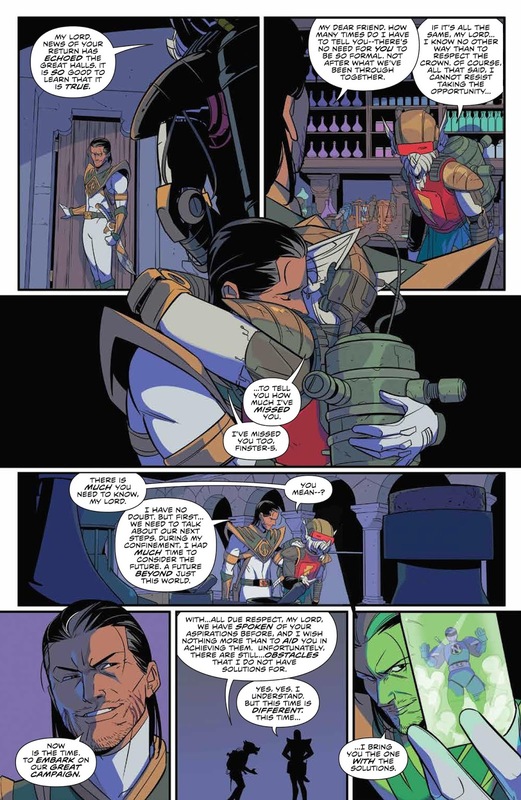 Drakkon tells the Ranger Sentries to assemble the Generals and have them meet him in the Gold Room and wait for him as he heads off to greet his old friend Finster Five (a cyborg created by adding parts of Alpha 5 to Finster) embracing him and tells him he has brought something to help them.... Ninjor, who has been shrunken and captured in a glass jar. During all of this the Rangers are back home grieving for Tommy. 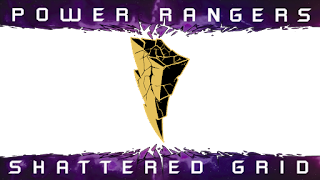 After Kimberly returns to the Command Center with Tommy and Jenn who is unconscious the Rangers wait as Alpha and Zordon try everything they can to save Tommy. Zordon tells the Rangers the sad news that there is nothing they can do, Tommy is indeed gone. They decide they can't just let his mother think her son disappeared never knowing what happened so they plan on returning him to the alley so he can be found by the cops and his mother can have some sense of closure. 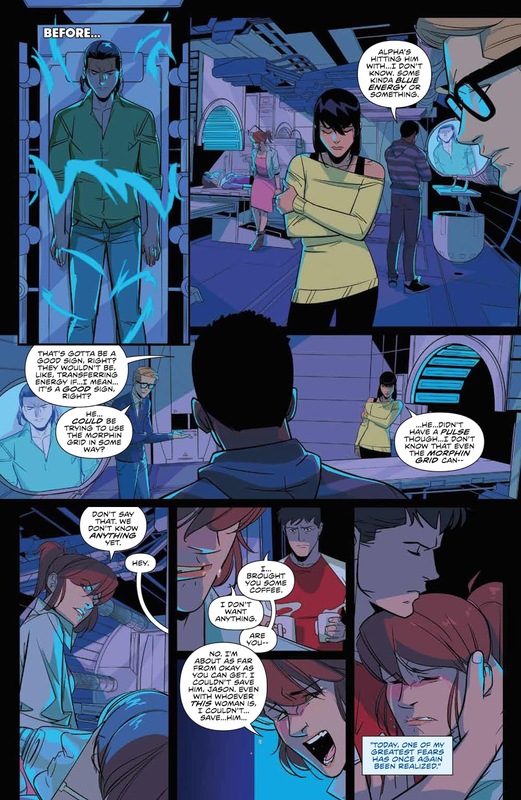 Theses scenes are so powerful, and both Higgins and Di Nicuolo's collaboration really shines here showing how deeply this affects them. I really loved the scene with Jason because it shows how (despite the drama between the actors) Jason and Tommy were really close friends. Jason's scenes are not the only ones though as Zordon and the rest of the Rangers all show how great this loss is. We see how the next few days play out from the incredibly power scene where the cops come to Tommy's house and tell her that her son is gone with his friends all there to support her, to Jason painfully taking on the Dragonzord powers which grant him the Dragon Shield, to seeing how impactful his passing is to the rest of the school finally to his funeral. After the funeral Jen, who is now awake briefs the Power Rangers on who she is and where she is from. She lets them know that she came from the future to try to prevent this from happening but Tommy's death has broken time, showing them how the timeline was supposed to be and with Tommy gone the Moprhing Grid has placed each era of time in their own pocket universes. Due to all of this she can not travel back any further as the past is now fixed. WOW slow clap moment! 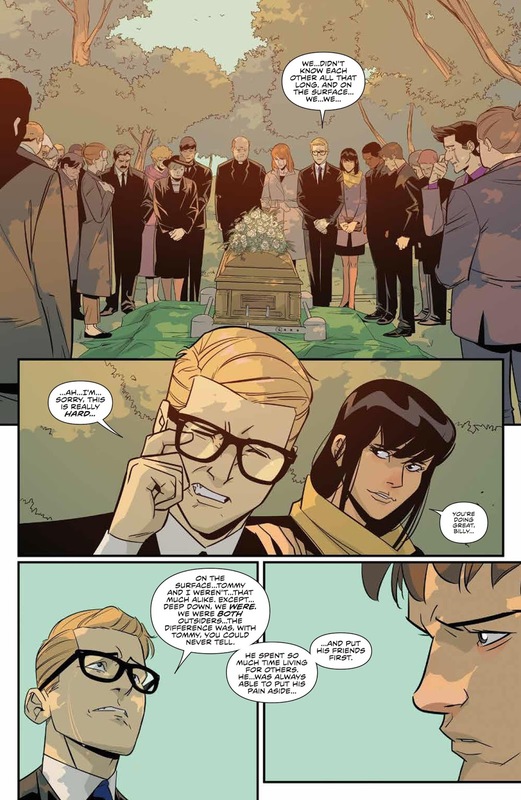 Higgins and Di Nicuolo really pack so much into these small scenes where a lot of the weight falls to Di Nicuolo who brilliantly captures the raw emotions of everyone on these pages. We now arrive in the now Super Samurai timeline/pocket universe where we see Lauren as the Red Samurai Ranger is trying out a new symbol power. Just as we find out that the Nighloks are back and that Jayden and Mentor Ji are out looking into things Lord Drakkon and his army invades. The Super Samurai Rangers morph and take on this attacking force but are no match and fall with Lauren being blasted away. This fight is brutal! I mean the Samurai Rangers try to take on the Sentries but their strength and shear numbers are just too much. Back at the command center Billy and Trini have come up with a plan using the Time Force technology along with the Black Dragon tech they may not be able to travel through time, but they can cross the pocket universes to try to prevent Drakkon from shattering everything. Just then an alarm goes off in the Command Center warning the Power Rangers of the trouble at the Shiba House. The Power Rangers use their new tech to travel to the Super Samurai universe to find that Drakkon and his forces have already defeated the Samurai Rangers, but they do manage to find and escape with Lauren as a group of Mastodon Sentries arrive to retrieve Lauren and begin their onslaught on the Rangers.This was just awesome to see the Rangers swoop in for the save, but at the same time barely make it out alive. Jason also is pretty badass with his powers now fully merged with the Dragonzrod Power Coin when he morphs, he morphs with the Dragon Shield already on him, no having to summon it like he did on the show. The issues leaves off with another WHAT?! moment, but to hear and that is all I can say in this review. 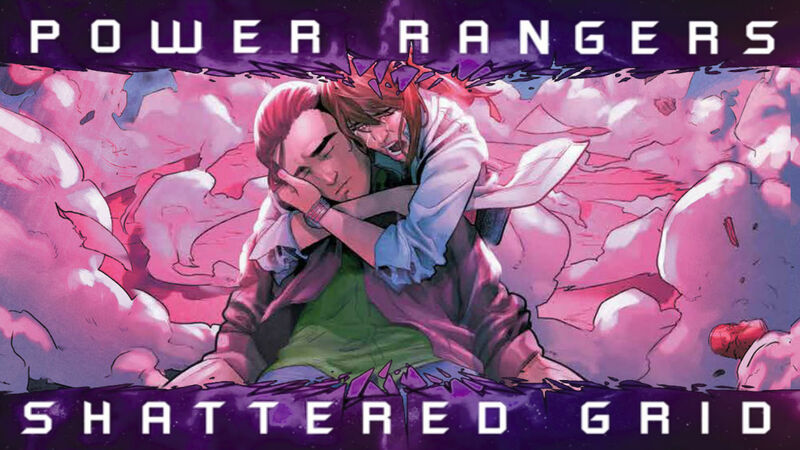 I don't want to spoil this issue in this review, as this is another great moment for Power Ranger fans, but if you want to discuss this issue spoilers and all you can join me tonight on the latest episode of Shattered Grid: MMPR #26 Review - Go, Go Samurai! 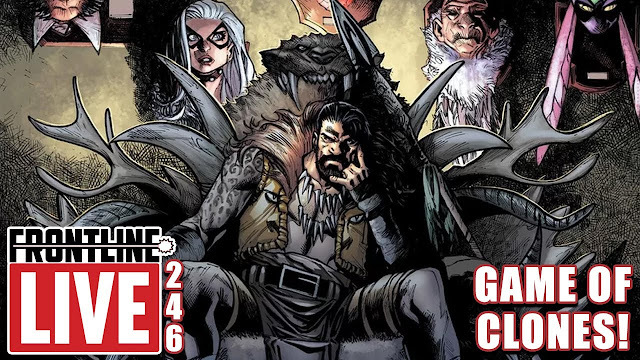 at 10:00 PM ET on Comic Frontline's YouTube Channel. Overall this issue once again far exceeds the hype of this event. 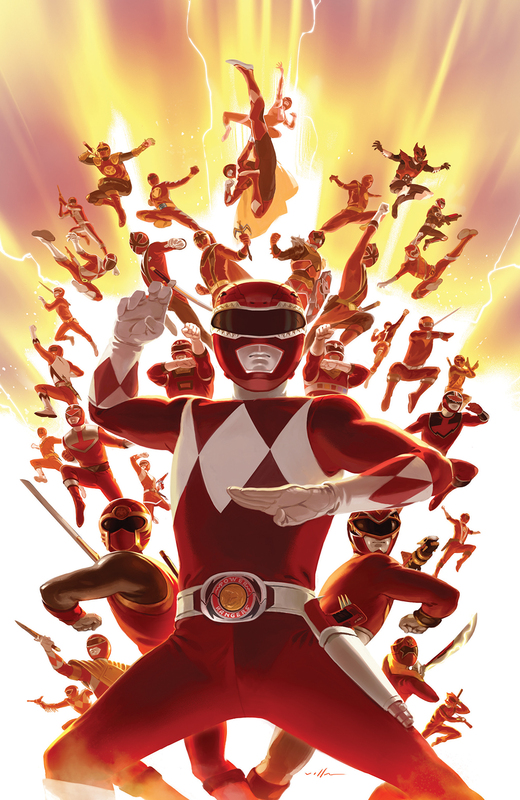 I have been a fan of Power Rangers since the beginning and if you are like me, or someone who just got into Power Rangers, or someone who was into them at one point then outgrew them I highly recommend picking up this series! I have never seen anything on screen or in a book bigger than this event in the 25 year history of the show. Kyle Higgins kills it here and Daniele Di Nicuolo's art brings those powerful words to an emotional apex. The back up story with Blue Senturion (Ninjor still isn't in this one yet) is fun, and could tie into Shattered Grid which is new for the back up stories. 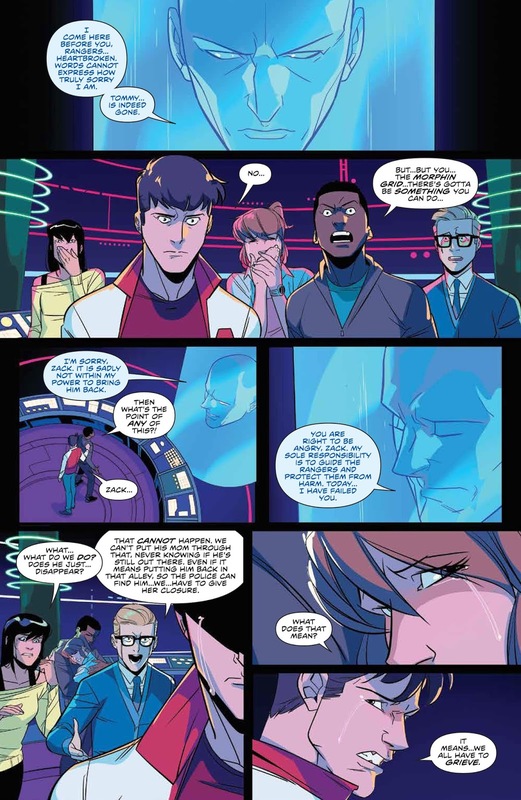 Blue Senturion is told to leave the case of the Power Rangers committing crimes alone by his chief but decides justice must be served. While I always enjoy the back up stories, they usually feel out of place in the world that Higgins has created, but again this one feels more like an extension of it. I look forward to reading these a lot. 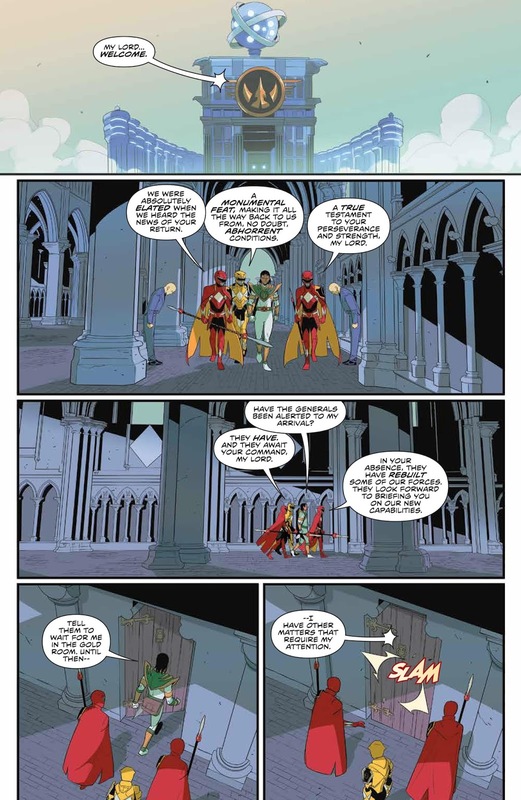 Ryan Ferrier and Bachan continue to demand my attention with this back up story to the point where I would like an actual mini series come out of it. 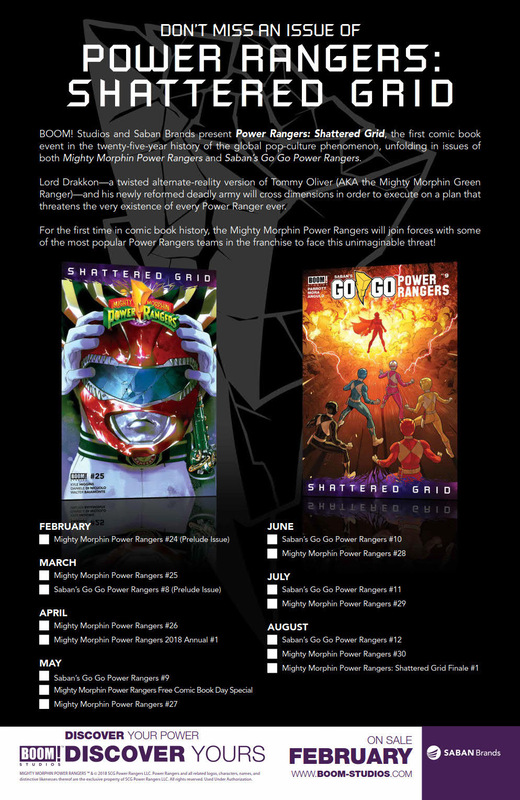 Copies of Mighty Morphin Power Rangers #26 are now available for sale at local comic book shops or at the BOOM! 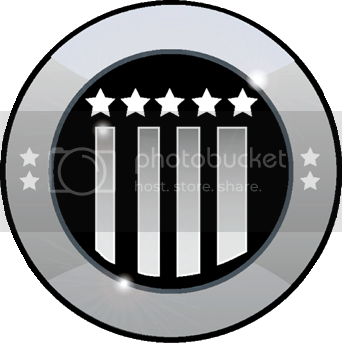 Studios webstore. 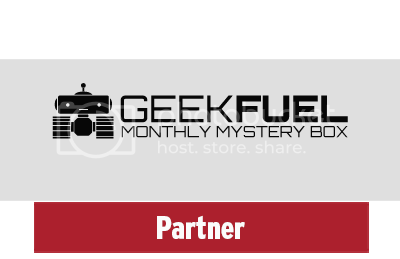 Digital copies can be purchased from content providers like comiXology, iBooks, Google Play, and the BOOM! Studios app.